The Melody II water ionizer is one of the new H2-Series of water ionizers. It's an upgrade of the legendary JP104 and now has advanced SmartDesign electrodes, DARC cleaning and Next Generation SMSP power supply with AutoAdjust! Our customers have always loved the Jupiter Melody water ionizer and now they will love the Melody II water ionizer even better! You can see many awesome reviews below! The Melody II has continuous cleaning and post cleaning for perfect water always. The AlkaViva Melody ionizer's LIFETIME Warranty on all parts (even plates) and Lifetime Limited Warranty on labor gives you assurance your Melody II water ionizer will last. The Jupiter Melody water ionizer has five levels of alkaline water and two levels of acid water. In addition you can set it for just getting filtered water whenever you want. The Melody water ionizer gets great ionization with 5-plate electro-plated platinum coated titanium ionizing plates and integrated MICOM computer circuitry throughout. The Jupiter Melody ionizer has a high-quality stainless steel output spout, an easy wipe-down, one-touch control panel, and a calcium port inside each filter. In addition to the continuous cleaning, the Melody II has a unique post-operation automatic, silent cleansing for the final touch of perfection and extended lifespan. 1/4 inlet tube and 3/8" output hosing. Continuous Cleaning: The Melody II water ionizer has one of the most advanced self-cleaning systems inside the water cell in the world! It's called continuous-cleaning. What this means is the Melody ionizer cleans itself all the time - while it's pouring. The Melody water ionizer delivers to you your alkaline water from the alkaline sprout without interruption. No more waiting even when your water ionizer is cleaning itself! Every water ionizer in the world, worth investing in, has an inbuilt cleansing routine. This ensures that any particles that may find their way past the filter are not 'caught' in the ionizing cells. The method is simple - the magnetic [electrical] field in the chamber is reversed so that any mineral that has energetically adhered to the Platinum on the electrode plate is repelled and flushed away. With the Melody water ionizer each time you use it, the poles are reversed automatically and continuously while pouring. One reason that the Jupiter Melody was always one of the best water ionizers is because it used a basic form of continuous-cleaning. Now, with the upgrade to continuous-cleaning the Melody II will reverse polarity within the water cell even more frequently during use. Continuous-cleaning keeps a water ionizer free of calcium within the water cell. The results of this level of internal cleaning is that the Melody water ionizer will still be able to produce the same pH and ORP readings as brand new when it's 10 or more years old! Mini-Computer (Mi-Com) Integrated Computer Circuitry means that your water ionizer will perform at its peak without any attention from you. Computer circuitry ensures the best pH and ORP, always, but also allows other features to be fully automatic, such as hot water and low pressure protection. SmartDesign Electrodes The electrode design of the H2-Series water ionizers is so proprietary that all I can tell you is they are designed to perform! In other words, they are expertly engineered to get the maximum molecular Hydrogen (H2-) or ORP per unit of pH of any other electrode design anywhere. The exact way that is done is a proprietary secret, but I can say it works. The performance is outstanding! These are pure, solid, medical grade platinum-coated titanium electrodes which are configured in such a way and combined with advanced electronics, to produce the best results. The Melody II gives you an ideal balance between of five highly engineered SmartDesign Electrodes, the right amount and kind of power to run them, a great flow rate and solid performance. Voice confirmation means you are alerted to any change of pH. Filter usage display means you can see at a glance an estimate of how much filter life you have left. It's a handy indicator that you can use to assess when to order a new filter. Optional ability to connect direct to main cold water line means you really don't even need your Melody II attached to your tap. With a 1/4" hole in your counter, or a G2 faucet, it can attach directly to your cold water feed line. All you need do to have a glass of water is to turn it on at the convenient front flow valve. Filtration: Be assured that with an H2-Series water ionizer you have awesome filtration. 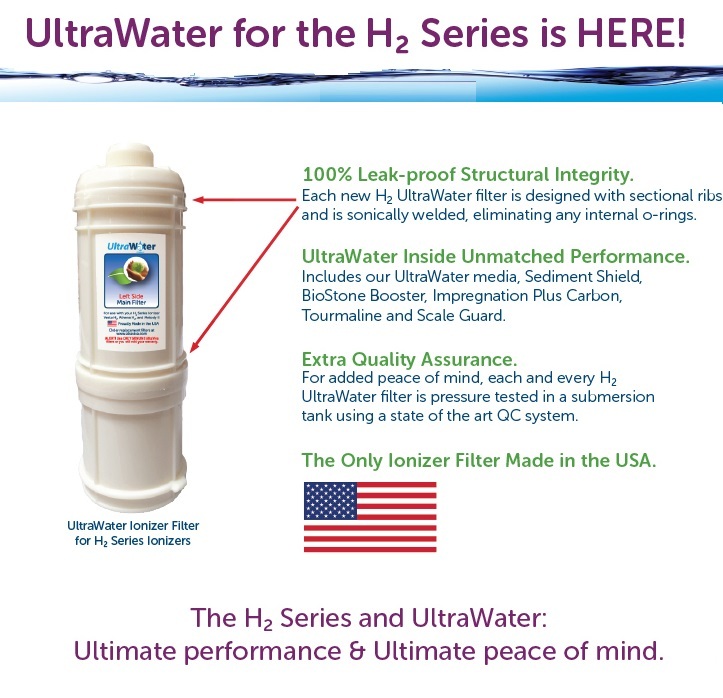 All new H2-Series water ionizers are shipped with patented UltraWater filters installed. This ensures you have the newest & best technology in water filtration with any of the new H2-Series water ionizers. Real-time Flow Control System: The Melody II’s Real-time Flow Control System gives you complete control of your flow rate. You can see and adjust the flow-rate with every use. AutoAdjust: With AutoAdjust you can be sure the power is always adjusted to give you the best levels of ORP for your ionized water. This ensures you get the best H2 (antioxidants) at every level of pH. This AutoAdjust feature is an amazing upgrade and great feature of the Melody II water ionizer. The parts within all AlkaViva water ionizers are of the quality that will last a lifetime, and they have lifetime-parts/5-year-labor warranties. The US importers, AlkaViva, have a repair and servicing depot located in Reno, Nevada. Because AlkaViva requires that you activate your warranty within 30 days of your purchase date in order to qualify for their lifetime warranty, we at Alkaline Water Plus will register your water ionizer for you. Just email us support@alkalinewaterplus.com with the serial number on the back of your machine when it arrives and we will take care of the rest. Make sure you do this, because the warranty defaults to 1-year if it's not registered within 30 days of purchase. Failure to take the necessary steps to register the warranty can void your 60-day trial with Alkaline Water Plus. You can see a full statement of their warranty at the bottom of this page: /water-ionizers-filters/jupiter-water-ionizers-filters/. All AlkaViva water ionizers are tested before leaving the AlkaViva warehouse (without using the filters) and factory for quality control purposes. There is usually a small amount of residual water, so plugs are placed on all water ionizer ports for shipping. Please follow these guidelines for removing the quick-connect plugs. Save the plugs for future use. Free high-quality PH Reagent Testing Kit included. Protection Devices: 2 built-in temperature sensors and fuse to protect machine from overloads. Follow the link to watch a thorough demonstration of installing any of the H2 water ionizers. 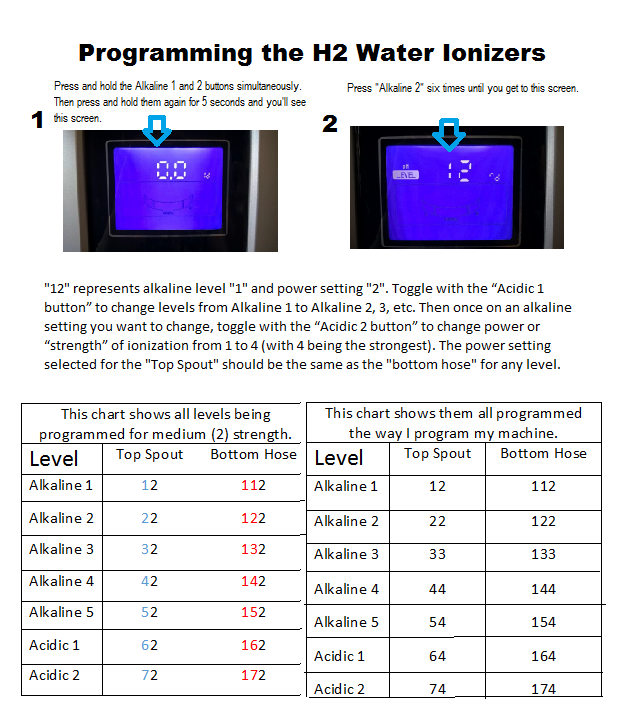 H2 water ionizers (including the Melody II) come already set for the average water. For those who want to, though, these water ionizers are programmable. Here are the directions. Patented dual filters consisting of 0.1 micron filters combine with space-fiber technology to efficiently filter almost any tap water. The filter life change indicator lets you know when it’s time to replace your filters. You have the ability with two filters to really make sure your water is filtered properly. These advanced filters also have anti-scale filtration built in. Read more information about UltraWater filters. If you are using well water, softened water, a water distiller or a Reverse Osmosis machine, please contact us. The plastics used are BPA free, PE free, ABS free and food grade. Please check below to see our customer's Melody water ionizer reviews.